This is a personal message from Mehdi Kajbaf, Co-Founder of Matboard and More. My best friend Dragan his beautiful new bride Andelija recently got married and asked me for fun picture framing ideas to remember the occasion. Of course I recommended a signature matboard and frame for the occasion. It’s an incredibly simple way to mark the occasion, and you get an heirloom that will last a life time. We began by selecting the photo they wanted to use, in this case it was an 8×12? picture. We then decided to add 6? around the top and sides of the image. The bottom was 12? to allow ample space for all the signatures of the 250 guests! Having the big off-set and using top centering was a great way to provide balance in the overall display while allowing enough space for signatures. A black sharpie is the perfect marker to write on matboard with. 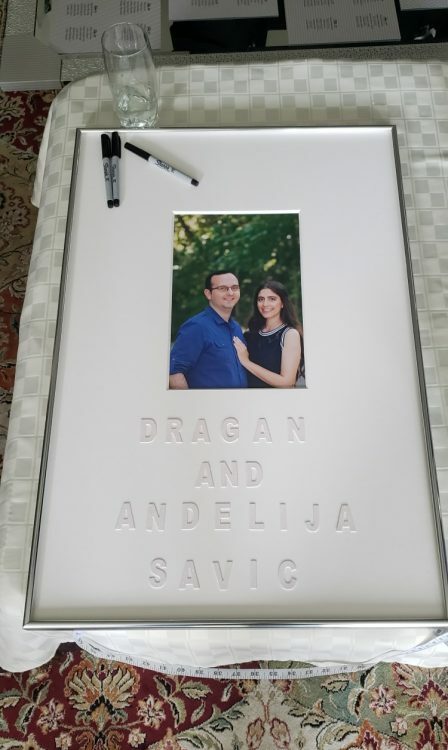 Dragan and Andelija took things a step further by gluing on letter cut outs they found at a local craft store. That’s a great way to give the presentation more life! 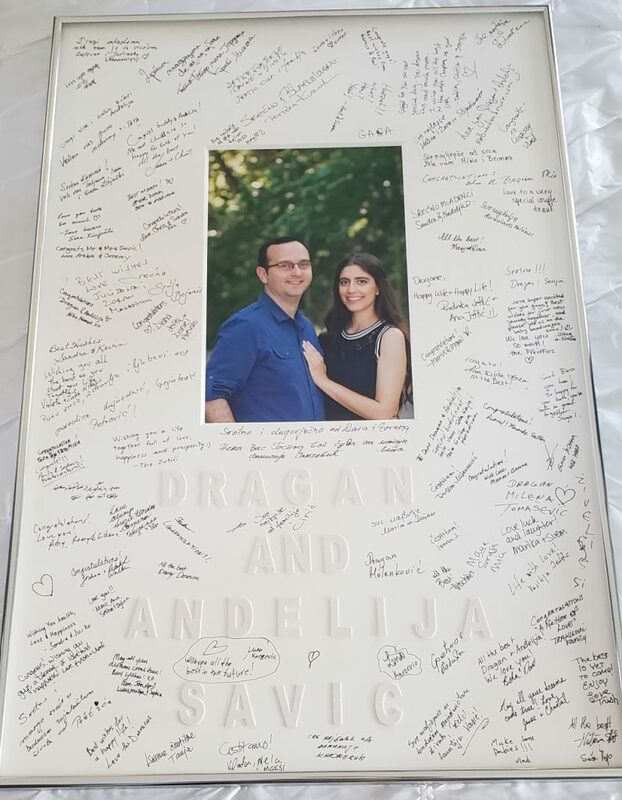 Finally Dragan decided on our shiny silver metal frame and premium plexiglass to complete the picture. Wooden frames would have looked great as well, but for a wedding theme silver is always a great option. It’s also very strong and durable which is critical for a wedding heirloom. 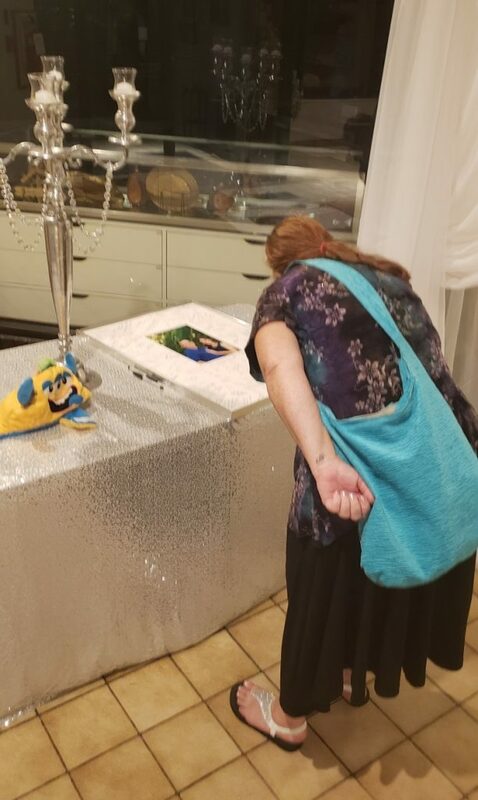 They placed the mat with the sharpie markers at the greeting line at the wedding and everyone loved the opportunity to write something personal. It was a huge hit! The final product is a keepsake that will remind them of their magical night! I’m so proud of the final product and very excited for the happy couple ? ?